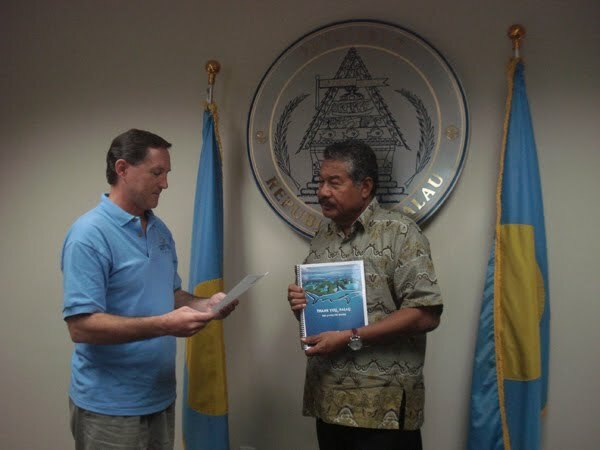 In January 2013, former President Tommy E. Remengesau Jr. (2001-2008) once again took office as President of the Republic of Palau, and true to form immediately set Palau on a leadership path in protection of the marine environment by proposing a ban on commercial fishing in Palau's EEZ. During his previous two consecutive terms from 2001 to 2008, President Remengesau led Palau to international acclaim with a staunch multi-pronged program of terrestrial and marine environment protection that included passage of ground-breaking shark protection legislation in 2003 that ultimately led to Palau becoming the world's first shark sanctuary in 2009. He also launched the Micronesia Challenge a regional environmental trust and helped create Palau's Protected Areas Network intended to preserve Palau's environment for generations to come. In 2002 in protest against the destructive and wasteful practice of shark-finning in Palau's waters, President Remengesau set fire to a catch of shark fins found on board a foreign fishing vessel arrested for illegal fishing in Palau's waters. The Presidents actions ignited a local and international outcry against the killing of sharks that led to the 2003 passage of landmark legislation protecting sharks in Palau's waters and culminated in the 2009 declaration by Palau as the worlds first shark sanctuary. In 2004 President Remengesau was recognized by Sharkproject as their very first Shark Guardian of the Year, with an award presented to Palau during BOOT SHOW 2004. The Presidents declaration to seek a ban on commercial fishing in Palau's EEZ was announced on March 12, 2013, in a speech made to the Prince of Monaco during an official visit to Palau. Despite the Presidents best intentions it will take an Act of Congress to pass the legislation necessary to give life to his vision and he will need all the support he can get. Ending commercial fishing in Palau's waters is an important step in the protection of our dwindling pelagic shark populations. I call on those of you who care for the health of the oceans and for the protection of sharks to therefore show support to President Remengesau and to Legislators in Palau for a ban on commercial fishing in Palau's EEZ. I'll get them delivered to President Remengesau and the Legislators. Finally, after what has been a rather lengthy drum-roll (as pointed out by a good friend)….. I am very pleased to announce the signing of an historic agreement between Sea Shepherd Conservation Society and The Republic of Palau, that will significantly improve and expand Palau’s capabilities to patrol and protect its’ shark sanctuary from illegal fishing. I am also very pleased and humbled that Palau Shark Sanctuary, the one-man shark conservation organization I founded in 2001 on a mission to convince Palau to declare its’ EEZ a shark sanctuary, was able to play a significant role in brokering this historic agreement between Sea Shepherd and Palau, in yet another huge step closer to giving true meaning and real life to Palau’s sanctuary. I heartily congratulate and deeply commend President Toribiong of Palau and Captain Paul Watson and CEO Steve Roest of Sea Shepherd Conservation Society on this exciting occasion for marine conservation. I also express my sincere appreciation to Palau’s Council of Chiefs, Ministers, Attorney’s General and other officials who helped guide, assist and craft this landmark agreement. Likewise, many thanks are due to Ms. Kim Mc Coy, Director of Legal Affairs at Sea Shepherd for her prompt and productive efforts in helping finalize the agreement. Congratulations and thanks to all! 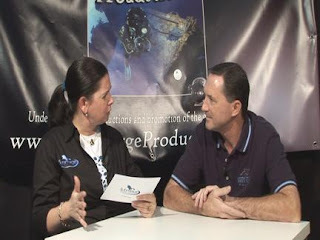 Interview with President Toribiong, Sea Shepherd and Palau Shark Sanctuary. Courtesy OTV Palau. Immediately below: Press Releases and other links. Koror, Palau, March 31, 2001 - The support of a high-tech vessel will have a significant impact on the marine law enforcement against illegal fishing practices after Palau declared its waters a marine sanctuary. On March 11, 2011, H.E. 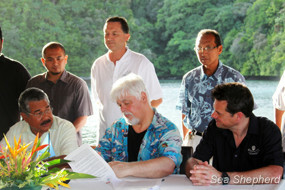 President Toribiong, President of the Republic of Palau, Paul Watson, President and Founder of the Sea Shepherd Conservation Society and Steve Roest, Chief Executive Officer of the Sea Shepherd Conservation Society signed a Memorandum of Agreement through which Sea Shepherd, a global marine conservation organization, will undertake an initial patrol campaign in the territorial waters of Palau and will provide advice in assessing options and best procedures for ongoing marine conservation operations. In addition, Sea Shepherd will fully fund the operations of its vessel M/Y Bob Barker, a former Norwegian whaler, and assets and will provide support and training to local authorities where needed or appropriate. The well equipped conservation society taps into high-tech resources such as helicopter surveillance, drone (UAV) technology, fast interceptor boats, and radar tracking systems, putting the marine enforcement entity of Palau at par with the illegal fishing operations it is trying to fight since the implementation of the world’s first shark sanctuary in September 2009, followed by the extension to a complete marine sanctuary in November 2010. As per my last blog, a deal is indeed in the works that will bring considerable international support and long awaited assets to Palau to support Palau's Division of Marine Law Enforcement in patrolling and protecting the world's first shark sanctuary. In fact the shark sanctuary declaration was later expanded by President Toribiong to include all marine mammals in Palau's Exclusive Economic Zone which is an area approximately the size of France and a daunting challenge for Palau's Law Enforcement. 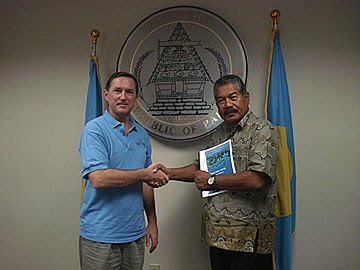 While the paperwork has taken a little longer than expected, the additional time being spent to finalize the agreement between Palau and the international conservation agency has been well-spent and the results are a stronger and more precise agreement with better defined roles that will improve effectiveness for all. If all goes well I'm hopeful that this week will be the Week of The Shark in Palau as our Shark Sanctuary finally gets some real teeth! Hang in there! Regarding patrol and enforcement assistance for Palau Shark Sanctuary...well, true to the old adage, the job isn't done until the paperwork is finished! As such, there are a few more "i's" to be dotted and "t's" to be crossed in the Memorandum of Agreement between Palau and the "International Conservation Organization" that has committed considerable resources to Palau, before official wraps can be taken off the program and formal announcements made. I've been assured by President Toribiongs office that final details will be taken care of this coming Monday, clearing the way formal announcements. It's an exciting time for Palau as the need for assistance to enforce the sanctuary and Palau's fisheries regulations is highlighted by very recent events that took place concurrent with discussions regarding enforcement assistance. Within the last two weeks illegal foreign fishing vessels have been targeting Palau's southwest islands and laying waste to Palau's reefs and fish stocks including many turtles while ill-equipped local rangers remained powerless to stop the raiders who are far better equipped. It's a classic David and Goliath battle. Rich "First World" nations raiding and robbing emerging Island Nations simply because they can! Illegal, immoral, and to date unstoppable. I am hopeful that the tides may finally be changing. They need to. Please be patient and remain tuned for full details. At Long Last! Help Is On The Way! I'm way overdue for making a post but have not been idle in the meantime. One of the biggest criticisms of Palau's shark sanctuary was Palau's inability to effectively patrol it. With only one patrol boat operated by Palau Marine Law Enforcement and an EEZ and sanctuary almost as big as France, much more help in enforcement is needed. I'm pleased to report that later this week, (March 14 - 18) an announcement is forthcoming about help being on it's way to Palau! In an agreement brokered by Palau Shark Sanctuary, a commitment has been secured from a major marine conservation organization to fund a patrol boat, hi-speed chase boats, helicopter and or drones (UAV) to help patrol Palau's shark sanctuary against poachers and illegal fishing activities. Please stay tuned for more information and announcements later this week. Field Report from Palau Capitol Building, Ngerulmud, Melekeok, Palau, Micronesia, April 16, 2010. I met with the President re: Shark Savers' Thank You. Others present were Mr. Ngirai Tmetuchel, Special Advisor to the President and Ms. Bernadette Carreon, Reporter, Palau Horizon (she’ll do a story in local paper which will be syndicated on line) and a few of the Presidents staff. I gave a brief history / reminder of how Shark Savers answered the call by my organization Palau Shark Sanctuary to rally international support to prevent the undoing of Palau’s landmark shark protection legislation as proposed in Senate Bill 8-44. Shark Savers created an on line petition calling on Palau to block SB 8-44 which resulted in conservation minded people around the world rising to the call. Those messages and petition were already provided to Palau’s President and copied to the Senate, Belau Tourism Association, Chamber of Commerce and others. Image Above Left: Copyright Shark Savers; Design Jamie Pollack. Following the President’s historic announcement at the U.N., Shark Savers again rose to the call and gathered over 1500 signatures on a Thank You note to the President for his ground breaking shark sanctuary announcement and wise leadership in conservation. I informed the President that I was present on behalf of Shark Savers and Executive Director Michael Skoletsky to hand over the printed and bound “thank you” signatures to him and to extend the deepest gratitude of Shark Savers and the thousands of people around the world who signed the petition and the thank you, for the Presidents Shark Sanctuary announcement at the United Nations General Assembly Meeting in New York, late last year. I read your letter to the President after which I presented him the award on yours and Shark Savers behalf. The President was deeply moved. He smiled when I mentioned the on line petition as there is no doubt he “heard the noise” at the time. He extended his thanks to Sharks Savers and those who signed the petition and thank you note for their positive and constructive contribution to the protection of sharks. He sends his best wishes to you and all Shark Savers and vowed to continue his efforts to fulfill his vision for Palau Shark Sanctuary. 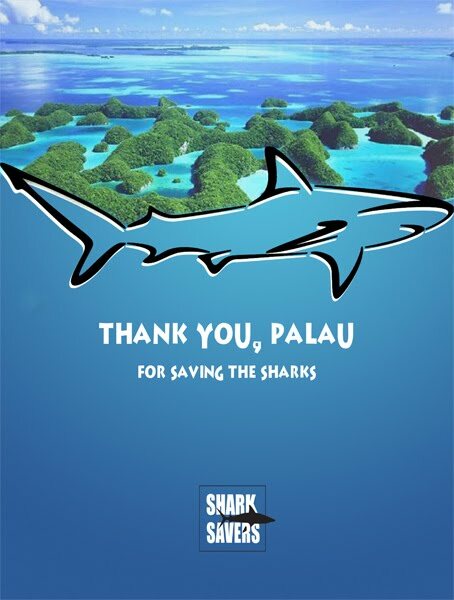 It is with great pleasure that we present to you this book containing the signatures and messages from the many people throughout the world who are grateful for your actions to protect the sharks of Palau. As you read through the comments in the book, you will notice how greatly moved we all are that you have taken this important and bold action. Palau has become much more than a place in our diving logs, but a place in our hearts, as well. 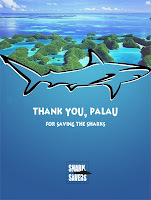 Sharks are important to us, to Palau, and to the world. After Palau took its pioneering step, the Maldives has joined you in declaring its waters a shark sanctuary. Honduras has placed a moratorium on shark fishing as it considers doing the same. We hope that you have started a trend among the nations that harbor the remaining sharks. We also thank Palau for taking the lead at CITES to protect shark species from international trade. While we are all disappointed at the lack of progress at CITES this year, we thank you for leading the fight. During a recent business trip to Germany to attend BOOT show in Dusseldoerf, I was interviewd by Ms. Liesbeth Liekens of Submerge Productions and SVARnet TV. Liesbeth recommended viewing using the Silverlight video player but its also available in Flash, but that will be discontinued soon. Click here for the interview. TITLE: Dermot Keane and the Shark Sanctuary in Palau. Click here for information. Popular Episodes and New Episodes.